What do you do if you’ve destroyed a set of clothes while working on your vehicle? You Ask a Clean Person to reach into her bag of laundry tricks and tell you about all the grease-stain removal products she’s got listed in her mental rolodex. Back in November, our very own Stef Schrader took to Twitter to lament the state of the clothes she’d been wearing while working on her Volkswagen race car. They were covered in grease and oil and dirt and her go-to product, Simple Green, wasn’t touching the mess. So I jumped in. Here’s what I suggested Stef do: Use Pine Sol or Lestoil to pre-treat the stains, and to launder the clothes using Tide Ultra Stain Release which, of all the Tides, is the best Tide for stain removal. Now, there are other good laundry detergents out there (Persil!) but people who test for things like The Best Laundry Detergent chose the Tides and if they choose the Tides I’m gonna recommend you also choose the Tides. One other general tip to offer on the laundering of grease-stained clothing is that you may want to skip the dryer in favor of hang drying, because a wet garment can obscure a lingering grease or oil stain, and the heat of a dryer will set that stain. Pine Sol and Lestoil are similar products that we tend to think of as the stuff we use to clean our floors, but they’re excellent laundry pre-treatment options for grease and oil stains, regardless of whether they come from your VW or your salad dressing. But, had I not been contained by Twitter’s character limits, I would also have suggested some other things. So here goes! Pine Sol or Lestoil, but in a different way: Pine Sol and Lestoil can be used to pre-treat laundry, but in the case of heavily soiled wrenching gear, it’s best to use those products directly in the washing machine in conjunction with your regular laundry detergent. A half a cup will do you. A note for those of you who have high efficiency washing machines: Many people report that the smell of Pine Sol and Lestoil lingers quite strongly on their clothes after washing in an HE machine. Given that, I generally suggest that people with that type of machine either choose a different option for grease-stain removal, or use the products verrrrry sparingly. Gojo: Yup, good old Gojo! The stuff you use to get grease off your hands will also get grease off your clothes. Smear the stains with Gojo and then launder as usual. Purple Power: This one came up in the comments on Stef’s post, so I know some of you know about this stuff. Like Pine Sol and Lestoil, Purple Power is a household cleaner — specifically, a degreaser — that may also be used for laundry. It’s good for two reasons: 1. It works and 2. It comes in a spray bottle, making deploying it on grease stained clothing a bit easier than the dab-on method required with the Pine Sol, or the smear-on of the Gojo. WD-40 or brake cleaner: The pro of these two products — which you’ll apply directly to grease stains, allow to sit on the fabric for a minute or so to penetrate the stain, then flush with cold running water while massaging dish soap into the stained area — is that you probably already have them in your garage. Also they work! But the con is that WD-40 and many formulas of brake cleaner are flammable, which means they shouldn’t be used as a pre-treatment for garments that are going to go directly into the washing machine. So! They’re an option but there are some drawbacks to consider. So those are all the things I would have told Stef, that I’m now telling you, if I hadn’t been dashing off quick replies on Twitter. 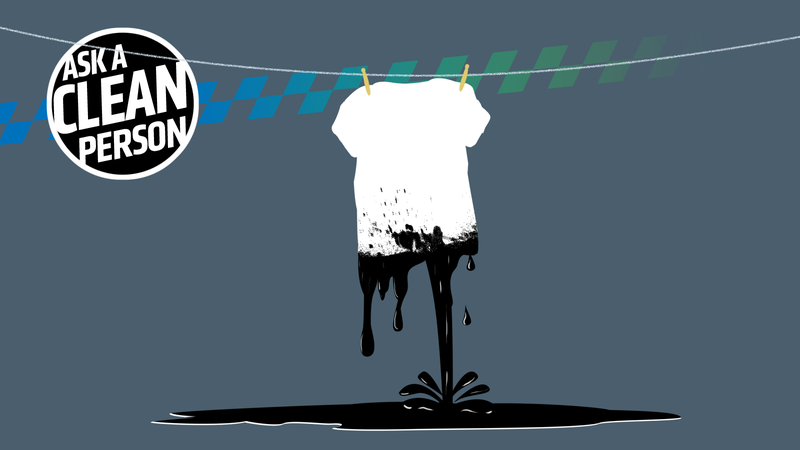 After Stef wrote about her semi-successful foray into un-staining her stained clothes, a reader got in touch with us to share his secret to saving his grease-stained clothes. One I’d heard before! But one which has enough of a whiff of urban legend to it that I never wanted to recommend it without trying it myself or a testimonial from a trusted source. And you, my fine friends here at this site, are trusted sources so let’s let Ian take it away! I know that you, Jolie, already addressed a solution for the greased up clothes, but my family has always taken an easier approach: Coke. My father did 12 of his 20 Air Force years as a jet turbine mechanic, absolutely ruining all of his uniforms with fuel, oil, and grease. All the crew wives would load up their disgusting clothes into a machine and dump a can of Coca-Cola in with the normal detergent. It does the trick. I still do it with my jeans, shirts, and garage rags to keep them petroleum product free after wrenching. I’ve only done it with a top loading machine, letting it fill most the way with water it will use and pour a whole can in for nasty stuff, half can for a small load. In front loaders, I’m fairly certain my mother pours the coke in first so that it goes into the reservoir to be cycled with the water. Works like a charm; no scrubbing or soaking required. I’ve also used this for food grease on nice materials (linens, silky polyester blend crap female clothes) and it seems to do the job there, too. So yeah: for greasy, oily clothes use Coca-Cola. What a delight! Please always feel free to get in touch to share your secrets with me. Of course, you could avoid all of this entirely if you opted to wear coveralls. Help! How Do I Wash A Fireproof Racing Suit?